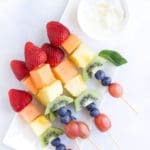 Fruit Kebabs are a fun, refreshing and healthy treat but are also a great way to encourage your kids’ creativity. If you are looking to increase the variety of fruits your children consume then fruit kebabs are an easy and fun way to do this. Serve new fruits, alongside familiar fruits to introduce new flavours and textures in a comfortable way. Prepare a pile of fruit, provide some skewers and let the fruit kebab party begin! 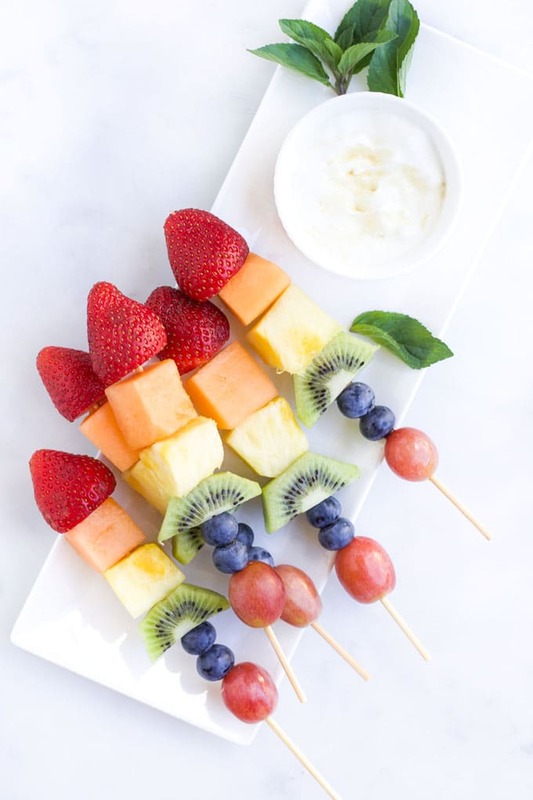 Fruit kebabs are pieces of fresh fruit threaded onto skewers. They can be served as a healthy snack or dessert. FRUITS THAT WORK WELL FOR FRUIT KEBABS? You can use any fruit to make kebabs but some fruits are only good if you plan to eat the kebabs immediately. These fruits oxidise quickly, turn brown and will look unappetising on your skewers. Skewers come in a range of sizes and what you use will depend on how big you want your kebab to be. You may feel uncomfortable offering your child a kebab stick with sharp ends and some school settings do not allow them in lunchboxes. If this is the case you can use lollipop sticks or purchase kebab sticks especially designed for children. Cookie Cutters (optional) – to cut fruit in different shapes. Our bodies benefit from variety and for optimal health, we need to eat a rainbow of nutrients and colours. By eating fruit kebabs, made using a selection of fruits, we are providing our children with a range of vitamins, minerals and antioxidants to help build their immunity. Constructed fruit kebabs can be stored in an airtight container or placed on a plate and covered with plastic wrap or beeswax sheet. It really depends on the fruit you use as to how long you can store them. From a food safety perspective, the fruit kebabs can be stored for a longer period of time but from a visual point of view, the kebabs can only really be stored in the refrigerator for up to 6 hours in advance. 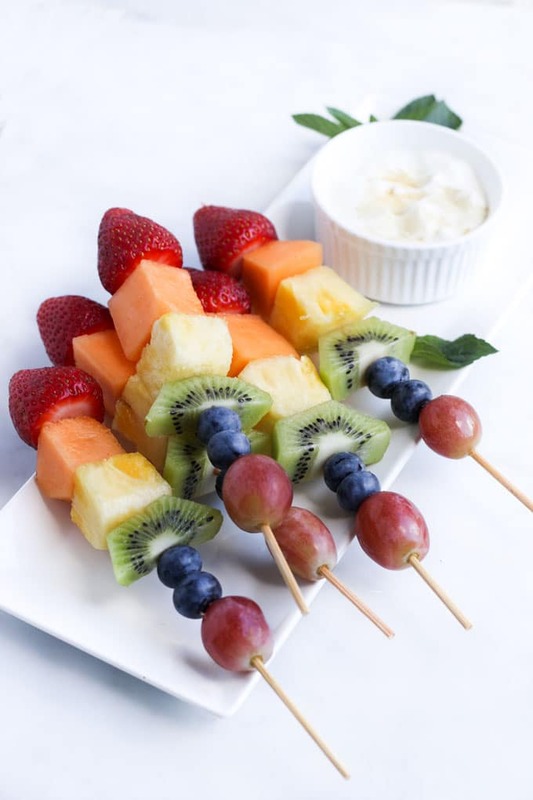 Provide kids with bowls of prepared fruits and skewers and allow them to get creative. Cut thick slices of fruit with larger surface areas (like pineapple and melon). Give children food cutters and allow them to cut shapes to thread onto the skewers. Kids can help to prepare dips. 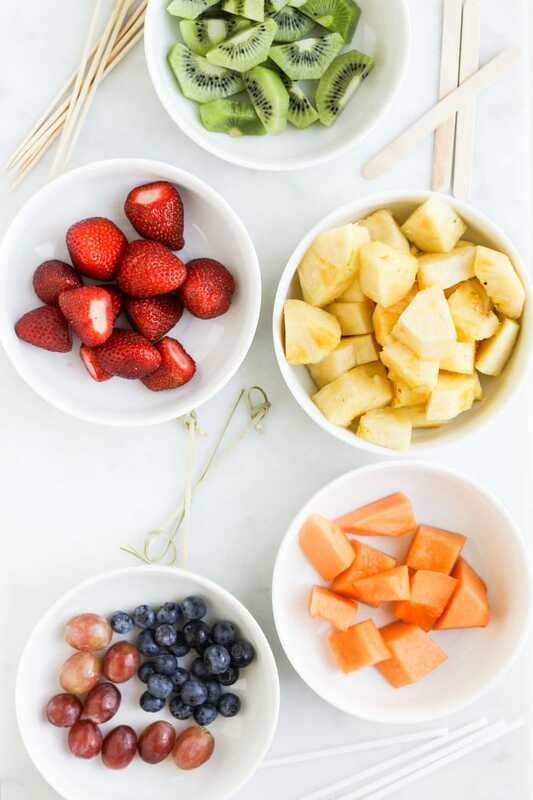 With supervision, allow children to chop fruits (you can purchase kid-friendly knives), skewer the fruits and make the dips. Have you tried making Fruit Kebabs with your kids? I’d love to know your favourite fruits to use and see your creative designs. Leave a comment below or tag me on Instagram. Place on a platter and serve with a dip of choice. This recipe is for the rainbow fruit kebab pictured. You can change the fruits to suit taste or season. Why not try making mini fruit kebabs for the lunchbox. 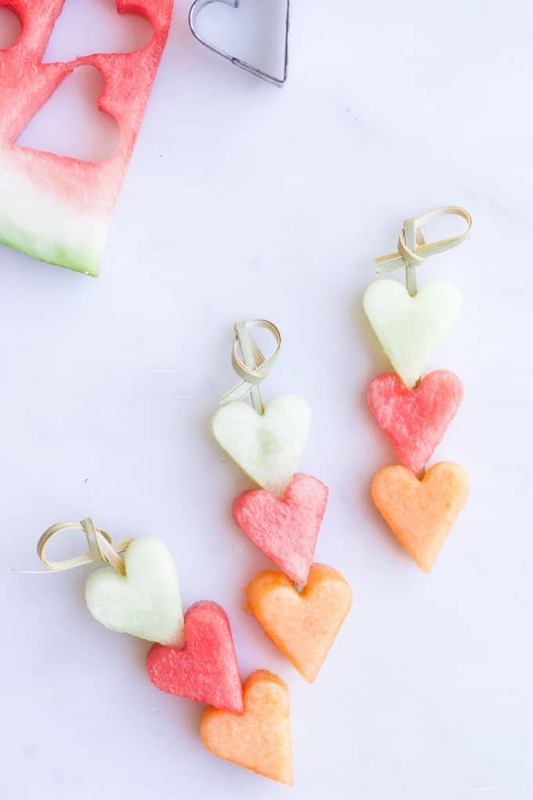 Melon ballers and cookie cutters allow you to create different shapes for your fruit kebabs. Dip suggestions are given in above post. Nutritional information is a rough guide only, calculated using an online calculator. Values will change depending on fruit used.